Our Programs - SpiritHorse Therapeutic Riding Center of Canton, Inc.
SpiritHorse Therapeutic Riding Center of Canton, Inc. has started up several programs: Disabilities, Children who are Victims of Abuse/Violence, Battered Women, and Youth After-Drug Rehab. Our mission is, "To Assist Each Child with Special Needs in Reaching Their Full Potential through Interaction with Horses". We also have as a mission: "A kind, rewarding home for older show horses and ponies, loving care, and proper burial on our ranch when they pass on." More than 750 centers in the United States provide recreational therapy, typically in group lessons. A much smaller number provide hippotherapy which is provided by occupational or physical therapists using the horse as a modality. A small number provide equine facilitated mental health, using the horse to foster relationship building and problem solving. SpiritHorse has developed a research-based program of equine-assisted healthcare, which is has a different goal than that of recreational therapy. It includes, for example, 178 specific steps provided in a one-on-one setting for intervening with its over 200 children who have been diagnosed with autism spectrum disorder. SpiritHorse provides the only child development services some of our children will ever receive. We teach many things taught in the school systems to typical kids. For example, we teach those diagnosed with autism how to focus and stay on a specific task through having leading, grooming, and tacking up as part of the lesson. We have seen miraculous breakthroughs with our children when they start performing these tasks. We have also reached an agreement with the University of North Texas and The Autism Treatment Center to study the results of biofeedback therapy coupled with our equine assisted healthcare for children with autism. Through brain imaging, the university will be able to provide more insight into the effectiveness of our methods and will allow us to refine them and develop new ones. A major SpiritHorse goal is to advance knowledge and develop more effective equine-assisted therapy methods for all types of disabilities, and share these methods worldwide. Championing the use of retired show horses and ponies is also a major goal at SpiritHorse. These horses are ideal for this type of work because they have had years of professional training and show experience. These schoolmasters are the safest mounts for children with disabilities. We currently have have wonderful therapy ponies and horses that are selected very carefully based upon thier gentleness, level of training, and the love of their work. Since most of the work is walking and our children cannot ride for very long, it's not really much more work than walking around the pastures where they live 24/7. Our horses and ponies love their work. We believe horses and ponies have the most accessible spirit of almost any creature and the vast majority have very beautiful spirits. They have one advantage over humans in that they do not have an ego to get in the way of their relationships. We also believe that children with disabilities have very accessible and beautiful spirits. We believe that this spiritual connection is what makes this intervention work. Our horses and ponies always greet the children who lead them from wheelchairs, walkers, and canes. They are so happy to see their riders. The average age of our horses and ponies is fifteen years. They work here until our veterinarian advises that they are uncomfortable with the work, or unsafe (tripping, etc.). At this time they retire here on our ranch to live out their lives in peace and tranquility. When these wonderful old equines pass on they will be buried in the back pasture with a tree planted in their memory. With the assistance of their instructor, lessons start with the rider leading the pony or horse from the pasture gate to the barn. Our ponies and horses can lead from wheelchairs, walkers, and canes. 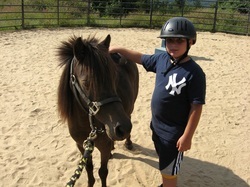 Many of our youngest children with disabilities lead their ponies independently. If the child is in their parents arms we place the lead rope in their hands and they lead their pony. We encourage all to participate. In fifteen years of operation at SpiritHorse International in Texas, as the result of their research and development and the faithful application of our methods by our certified instructors, we have heard 64 children speak the first word of their lives, helped 48 children walk their first steps to reach their ponies, and seen 38 children sit up for the first time. A study by a leading medical school showed that we moved 24 severely autistic children to mild autism and one to non-autistic in just six months of intervention with our research-based, award-winning methods. SpiritHorse Therapeutic provides individual therapeutic horseback riding lessons together with one-on-one mentors to children who are victims of abuse, which will promote internal healing and mental health. Lessons are provided on a weekly basis, year-round, with short holiday and seasonal break. We are utilizing riding and horse care activities to impact this problem because these activities and the resulting relationships established between horse and rider have been shown to provide an effective form of therapy. Horses are one of the kindest of all animals. The combination of their size and gentleness is especially helpful in teaching children that it is possible to be both strong and kind without sacrificing one for the other. We believe that this experience will help break the chain of abuse that travels from generation to generation. The relationship developed between rider and horse will build trust, be an emotional outlet and a source for affection and love that is needed so much by these victims. This will be instrumental in restoring mental health to a level that will allow them to re-enter the community with self confidence. SpiritHorse Therapeutic provides weekly therapeutic riding lessons for people of all ages with disabilities. We have served children and adults with Autism, ADHA, Down Syndrome, Cerebral Palsy, Pitt Hopkins Syndrome, developmental delays, intellectual disabilities, multiple sclerosis and more. Our goal is to schedule a rider within two weeks of the completion of their application. For applications, click on Application, above. We proceed in carefully developed and tested steps, with safety foremost, to develop the rider's balance and horsemanship skills. It is our goal to eventually have each of our riders be independent, under controlled conditions. The movement of the horse or pony stimulates the rider's vestibular system (inner ear) which not only controls balance, but all voluntary movement of the body, including speech. Half way through the lesson, our students who have an under-stimulated vestibular system (one form of sensory integration dysfunction) become more active vocally and in body movement. In 12 years of operation at the Corinth, TX Center, as the result of our research and development and the faithful application of our methods by our certified instructors, we have heard 104 children speak the first word of their lives, helped 59 children walk their first steps to reach their ponies, and seen 57 children sit up for the first time. A study by a leading medical school showed that we moved 24 severely autistic children to mild autism and one to non-autistic in just six months of intervention with our research-based, award-winning methods. 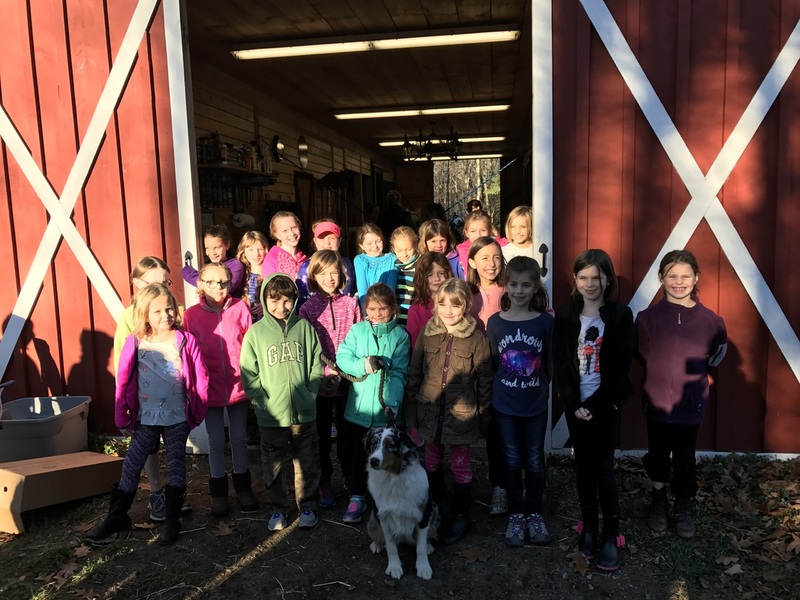 SpiritHorse Therapeutic Riding Center of Canton is now an approved vendor for the Girl Scouts of Connecticut! Our Girl Scout Programs run all year. Brownies and Girl Scouts can earn their Pets Merit Badge and/or Horsemanship badges. Contact us for more information!